Being pregnant is exciting and exhausting all at the same time. There are many things to think about, to prepare and to know. By clearing your mind and stretching your body can provide peace and muscular tone that will support you greatly during labor and delivery. While there are lots of benefits to working out during pregnancy, some people are intimidated by the idea of doing yoga. Check out the following benefits of prenatal yoga and see if they might change your mind. This post contains some affiliate links (which means if you make a purchase after clicking a link I will earn a small commission but it won’t cost you a penny more)! Click here for our full disclosure. There are so many benefits of prenatal yoga, but for time’s sake, we’ll just list our favorite benefits for now. Make sure to talk to your healthcare provider before starting any new exercise routines to ensure that it’s safe for you and your baby. By the way. If you want to make fitness super easy during pregnancy, you have to check out my friend Katie’s Belly only pregnancy program. It is amazing! She makes it easy to figure out what to eat that will nourish you and your baby, and help you get fit during pregnancy and protect your body from damage caused by gaining too much weight during pregnancy. At first, you may feel shy or intimidated to twist your body into those different positions, but once you do it a few times, you will be amazed how good you feel. Moving in a quiet space with other moms provides a nurturing setting that calms the nerves and allows you to feel your body. This calming effect not only effects you as mama, but also calms your baby. All those feel good hormones you experience, your baby will experience too. Pregnancy yoga helps you stretch your muscles while providing toning of the body as well. Learning to breathe through the stretches and getting in touch with the different muscles in your body can help you learn more about your body. With all the changes in your body occurring during pregnancy, breathing can become difficult. In the first trimester, some women experience a phenomenon that makes it hard to even catch their breath when they talk. Once your belly grows, your baby may begin pushing up into your lung space. Making it difficult to catch a full breath. By practicing yoga regularly while pregnant, you will find that these breathing issues become less noticeable. Plus, we all have seen moms to be on television breathing through contractions, but doing prenatal yoga prior to labor and delivery will help you practice breathing techniques that can help ease stress and tension, making labor less painful. While prenatal yoga is different from regular yoga, it still provides exceptional stamina and strength. This type of workout supports moms to be in having good flexibility and lots of energy. Sometimes pregnant moms get a little nervous and stressed during pregnancy. Prenatal yoga can relieve this stress. Back pain is another big issues for many women during pregnancy. Practicing yoga can give you an arsenal of stretches and poses to relieve pain in the back, arms and legs. All of these are common areas of stress for pregnant women and prenatal yoga can provide great relief. As our bodies grow and change during pregnancy, our balance is often thrown off. Thus, doing prenatal yoga regularly helps us know our bodies and increases our ability to maintain a healthy posture and balance. This means less chance of injury to our body and our baby. Sometimes we can feel like we are the only ones experiencing discomfort in our bodies. Thus, being around other pregnant moms helps us relax and have moral support during this special time. 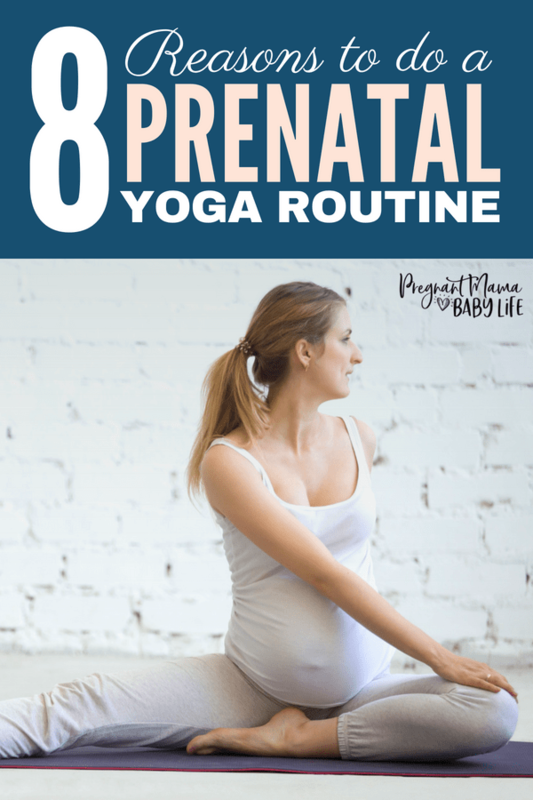 Taking the time to do pre-natal yoga provides a deep sense of connection to your new baby. The ability to be quiet and listen, feel and be, is a huge benefit to both yourself and your new little one. Take the time and cherish it. Taking the time for prenatal yoga can be difficult as our lives get busier throughout the pregnancy. However, making sure and putting yourself and your baby first will help you glide through to labor and delivery with a little more peace and a lot more grace. Prenatal yoga classes are often offered at local gyms, birthing centers and yoga studios. Take time for yoga today and relax into the pregnancy completely. P.S If you’re looking for some extra help during your pregnancy, you should check out this prenatal workout program. They set it up with pregnant mamas in mind to help strengthen your body and make labor and delivery so much easier. It’s totally worth the investment. Pregnancy Pilates | Can it help you have a better labor?